The nation's electric power delivery system is much like the telecommunications network of the past—dated and increasingly costly for consumers. 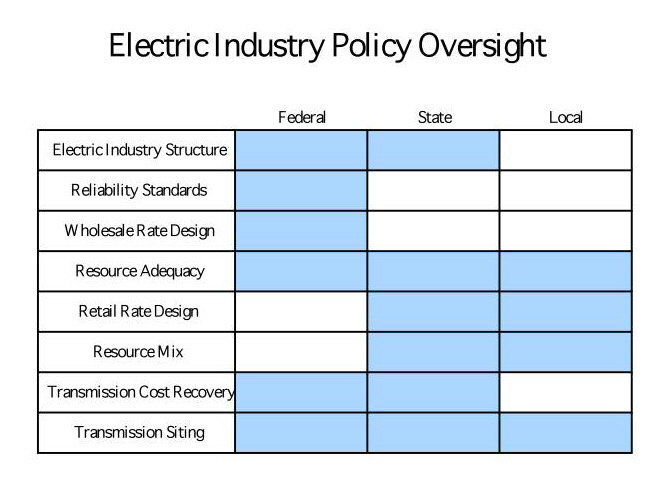 Electric power industry policy is a hodge podge, rooted in the federalism of 50 state laboratories. There is no coherent national vision and policy. Industry structure: There are overlapping federal and state authorities. Federal legislation (Energy Policy ACT, 1992) sanctions independent power producers (IPPs) and requires transmission owners to provide IPPs open, nondiscriminatory access to their transmission facilities and wholesale power markets. Some states have required IOUs to divest their generation assets and procure additional power supplies from IPPs. Other states, primarily in the northwest and southeast, have not required such IOU restructuring. 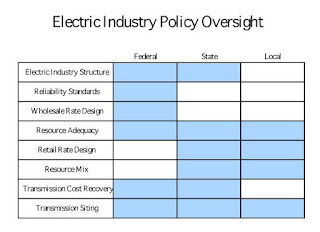 Reliability standards: Federal legislation (Energy Policy Act, 2005) mandates reliability standards for the entire American electric power industry. Wholesale rates: Federal Energy Regulatory Commission (FERC) approves wholesale market designs of RTO/ISOs. FERC also determines whether wholesale market prices are “just and reasonable. Three decades ago, one phone company was the monopoly provider of services across much of the United States, and it was illegal to plug other companies’ telephones and devices into that company’s network. Today, telecommunications choices and services are much greater thanks to legislation and technological advances that broke up the monopoly and later opened the door to competition in the telecommunications industry. The FCC, regulating communications (AT&T), and the Justice Department, regulating computers (IBM), held years of hearings about the exact distinctions between communications and computers, so they could harden their categories. The Internet showed communications and computers to be inextricably linked. The voice, video, and data monopolies and their regulators were surprised when voice became more than telephone service, video became more than television, and both became data on the Internet.. There is growing attention to demand response measurement and verification, with many entities such as the FERC, RTOs and ISOs, NAESB, state electric regulatory commissions, and several regional research entities all examining how to develop measurement and verification protocols or standards that accurately measure load reductions. CPUC – California Public Utilities Commission - (Wikipedia) San Francisco, CA - The CPUC has an ongoing rulemaking (R.08.-12-009) to consider policies for California investor-owned electric utilities to develop a smarter electric grid in the state. The proceeding considers policies, standards and protocols to guide the development of a smart grid system and facilitate integration of new technologies such as distributed generation, storage, demand-side technologies, and electric vehicles. The CPUC Regulates: Five commissioners each serve staggered six-year terms as the governing body of the agency. Commissioners are appointed by the governor and must be confirmed by the California State Senate. The Commission meets publicly twice a month to carry out the business of the agency, which may include the adoption of utility rate changes, rules on safety and service standards, implementation of conservation programs, investigation into unlawful or anticompetitive practices by regulated utilities and intervention into federal proceedings which affect California ratepayers. Privately-owned utilities in the state of California, including electric power, telecommunications, natural gas and water companies. Investigation into unlawful or anticompetitive practices by regulated utilities and intervention into federal proceedings which affect California ratepayers. EAC - Energy Advisory Committee - Mission is to provide advice to the U.S. Department of Energy in implementing the Energy Policy Act of 2005, executing the Energy Independence and Security Act of 2007, and modernizing the nation's electricity delivery infrastructure. Advise on electricity policy issues pertaining to the Department of Energy. Review and make recommendations concerning DOE electricity programs and initiatives. Advise DOE on issues related to current and future capacity of the electricity system (generation, transmission and distribution, regionally and nationally). Advise on the coordination between DOE and state and regional officials and the private sector on matters affecting electricity supply, demand and reliability. Advise on the coordination between Federal, State and utility industry authorities required to cope with supply disruption or other emergencies related to electricity generation and distribution. FCC - Federal Communication Commission - Seeking comments on its draft broadband plan, which it is preparing to send to Congress in February (Public Notice PDF). The FCC has released two such requests, one seeking comments on the role of broadband in teleworking and another on the role of broadband in building the Smart Grid. At hearings relating to its broadband initiative, the FCC heard power executives say that utilities need a dedicated chunk of bandwidth to use for the Smart Grid. Among those arguing for Smart-Grid specific bandwidth were American Electric Power, a leading power producer; Trilliant, a Smart Grid hardware and wireless communications company; and GridPoint, a Smart Grid software company. Not everyone agreed, however. Expressing the minority view was SmartSynch (now Itron Cellular Solutions), a company that uses IP over existing wireless networks for its metering products. SmartSynch opined that utilities already have access to multiple Smart Grid broadband networks. The development of a Smart Grid broadband policy was mandated by the American Reinvestment and Recovery Act (ARRA) passed earlier this year. Federal Smart Grid Task Force - Established under Title XIII of the Energy Independence and Security Act of 2007 (EISA) and includes experts from seven different Federal agencies. The DOE is represented by the Office of Electricity Delivery and Energy Reliability which is the Task Force lead, as well as the Office of Energy Efficiency and Renewable Energy and the National Energy Technology Laboratory. Other members include representatives from FERC, the Department of Commerce, the EPA, the Department of Homeland Security, the Department of Agriculture, and the Department of Defense. The mission of the Task Force is to ensure awareness, coordination and integration of the diverse activities of DOE's Office of Electricity Delivery and Energy Reliability and elsewhere in the Federal Government related to Smart Grid technologies, practices, and services. FERC - Federal Energy Regulatory Commission - United States federal agency with jurisdiction over interstate electricity sales, wholesale electric rates, hydroelectric licensing, natural gas pricing, and oil pipeline rates. FERC is also responsible for ensuring the reliability of the nation’s high-voltage interstate transmission system. NERC - The North American Electric Reliability Council - As part of the fallout of the Northeast Blackout of 2003, the Energy Policy Act of 2005 authorized FERC to designate a national Electric Reliability Organization (ERO). In 2006, FERC issued an order certifying NERC as the ERO for the United States. Prior to being the National ERO, NERC's guidelines for power system operation and accreditation were referred to as Policies, for which compliance was strongly encouraged yet ultimately voluntary. NERC has worked with all stakeholders over the past several years to revise its Policies into Standards, and now has authority to enforce those standards on power system entities operating in the United States, as well as several provinces in Canada, by way of significant financial penalties for noncompliance. NARUC - National Association of Regulatory Utility Commissioners - A non-profit association representing the State public service commissioners who regulate essential utility services, such as electricity, gas, telecommunications, water, and transportation, throughout the country. As regulators, our members are charged with protecting the public and ensuring that rates charged by regulated utilities are fair, just, and reasonable. NARUC and FERC established two collaborative efforts to address issues crucial to the effective implementation of demand response and the related topic of smart grids. NAESB - North American Energy Standards Board – (formerly the Gas Industry Standards Board or GISB) Houston, TX - Develops business practices to support the introduction of new services into the electric marketplace, complement the reliability standards set by the North American Electric Reliability Council and support the implementation of policies set by the Federal Energy Regulatory Commission. Regulates: Electric Reliability Regions (e.g. WECC), RTO’s, ISO’s, Electric Utilities and transmission rate cases filed when necessary. PUC’s - State Public Utility Commissions - Responsible for ensuring that electric utilities under their jurisdiction provide safe and reliable service at a reasonable price. PUCs analyze and determine if proposed utility infrastructure investments, like the deployment of Smart Grid technologies, are prudent investments. Investments are often evaluated based upon actual and realizable benefits, and while future benefits may be considered, they must be evaluated appropriately. EISA 2007 - The Energy Independence and Security Act of 2007 - Deploying the Smart Grid became the policy of the United States with passage of the Energy Independence and Security Act of 2007 (Title 13). The stated purpose of the act is “to move the United States toward greater energy independence and security, to increase the production of clean renewable fuels, to protect consumers, to increase the efficiency of products, buildings, and vehicles, to promote research on and deploy greenhouse gas capture and storage options, and to improve the energy performance of the Federal Government. EISA requires FERC, once sufficient consensus has been achieved through a process managed by NIST, to adopt standards and protocols necessary to ensure Smart Grid functionality and interoperability in the interstate transmission of electric power and in regional and wholesale markets. EPACT - Energy Policy Act of 1992 - Enacted 14 years after PURPA, again in an era of concern about the nation’s dependence on imported fuels. It required that competitive generators or any utility be given access to the utilities’ transmission grid on rates and terms that were comparable to those that the utility would charge itself for access to the grid. This access to the transmission grid became indispensable to the growth of wholesale power markets, whereby power generators can use the transmission system to send power to one another at fair and predictable rates and terms. EPACT92 effectively deregulated wholesale generation by creating a class of generators that were able to locate beyond a typical service territory with open access to the existing transmission system. EPACT requires that competitive generators or any utility be given access to the utilities’ transmission grid on rates and terms that were comparable to those that the utility would charge itself for access to the grid. The resulting competitive market encouraged wholesale, interstate power transfers across a system that was designed to protect local reliability, not bulk power transfers. EPACT05 - Energy Policy Act of 2005 (P.L. 109-58) set in place government activities intended to relieve congestion on the transmission system. The law creates an electric reliability organization that is to enforce mandatory reliability standards for the bulk-power system. In addition, processes are established to streamline the sitingof transmission facilities. ISO - Independent System Operator - An independent entity that controls a power grid to coordinate the generation and transmission of electricity, provide open transmission access to all market participants on a nondiscriminatory basis, and ensure a reliable power supply. Each ISO coordinates controls and monitors the operations of the electrical power system. An ISO is usually not for profit and can advise utilities within its territory on transmission expansion and maintenance, but does not have the responsibility to carry out the functions/ There are currently eight ISOs including Alberta, California, Florida, New England, New York, Ontario, and Texas plus four RTO’s. Cal-ISO regulates the transmission system within the State of California including Approval authority over Transmission Expansion Projects. NERC – CIP - Cyber Security Standards - NERC Standards CIP-002 through CIP-009 provides a cyber security framework for the identification and protection of Critical Cyber Assets to support reliable operation of the Bulk Electric System. These standards recognize the differing roles of each entity in the operation of the Bulk Electric System, the criticality and vulnerability of the assets needed to manage Bulk Electric System reliability, and the risks to which they are exposed. PURPA - 1978 Public Utility Regulatory Policies Act - Required that utilities buy power from companies that were not utilities. PURPA created a new industry of nonutility power generators. It was important to transmission policy because it required that the nonutility generators be given access to the transmission system in order to deliver their power onto the grid. SB 17 - California law requiring utility regulators plus every major utility in the state to develop a smart grid deployment plan. SB 17 was signed into law in October 2009 as Chapter 4 of California’s Public Utilities Code. It is the first smart-grid-only bill of its type that puts in place a precise timetable, both for the state to coordinate and produce some specificity about what it wants in a smart grid plan and for the utilities to respond. The new law requires California’s PUC to create a statewide smart grid deployment plan by July 1. The PUC has to work with the State Energy Resources Conservation and Development Commission, the state’s ISO “and other key stakeholders” to create that plan, says the law. The law requires every electric utility in the state with over 100,000 customers to develop its own a smart grid deployment plan by July 1, 2011. It allows, but does not require, other organizations to submit such plans. Every utility’s plan has to conform to the plan created by the PUC (DECISION ADOPTING REQUIREMENTS FOR SMART GRID DEPLOYMENT PLANS PURSUANT TO SENATE BILL 17 (PADILLA), CHAPTER 327, STATUTES OF 2009) -- and ensuring conformity and the compatibility of the utilities’ varied plans will fall to the California Energy Commission. One of the Federal Government’s top smart grid priorities is the work of NIST and FERC on a framework for interoperability standards. (See my Blog Article Standards Development Process) EISA requires FERC, once sufficient consensus has been achieved through a process managed by the National Institute of Standards and Technology (NIST), to adopt standards and protocols necessary to ensure Smart Grid functionality and interoperability in the interstate transmission of electric power and in regional and wholesale markets. This effort is focused on an accelerated timetable. The key balancing point is to develop standards that enable interoperability without being so prescriptive that prevents innovation. Secure Information Privacy - There is no statewide rule on how third parties may obtain access to customer usage information and how such rule will guide smart grid development. The CPUC should set data privacy and security rules for third party providers to obtain access to AMI data. The terms and conditions of any third party agreement must be transparent, accessible and easy to understand. Ensure Customer Access to Meter Data - Making information retrieval for customers and their independent aggregators of retail customer is time consuming and expensive. Timely access to customer meter data allows aggregators to assess the demand reductions achieved by their customers. the ability to move the new smart meters elsewhere on their property at the customer’s expense. Revenue Coupling (See my Blog Article Revenue Decoupling) - By breaking the link between the utility's sales and profits, decoupling creates an incentive for utilities to sell less energy and focus on energy efficiency . Ten states have adopted policies that decouple changes in utility revenue with changes in sales volume. Utilities Incentivized to Increase Invested Capitial - A utility is paid to own assets. Every utility’s gross income is a function of the regulated return on an asset added to every KwH regardless of what it cost to generate it. The higher the total capital expenditure approved by the regulators, the higher the regulated rate of return permitted during the effective life of that investment. Thus the utility naturally wants to maximize its operating flexibility by seeking to install the hardware with the broadest functionality, regardless of whether or not the economic return is necessarily well understood, and then wants to be able to use those assets to sell more electricity when the cost to generate the energy is lowest. This, in theory, will protect the utilities’ rate of return while reducing the absolute size of the rate increase required to pay for smart grid hardware. It has also incentivized utilities to make large and potentially speculative investments. Choosing the costlier solution that promises a broad range of performance enhancements i.e. automation based on meter infrastructure (AMI) rather than a previously proven (and cheap) use of technology to automate the reading of meters (AMR). Demand Response Restrictions - Under WECC rules, DR is not allowed to provide spinning resources. Patchwork Legislation - The state-by-state PUC approval process could create a patchwork approach, as different Smart Grid improvements could be adopted by neighboring states or even utilities within one state. PUCs also need to develop unique rate structures using Smart Grid technology by creating special time-of-use rates, whether hourly, critical peak pricing, or some other modification from the existing approaches. Utility Business Model - Utilities are often slow to adopt new technologies that have not been extensively proven outside of a laboratory. The existing utility business model does not provide economic rewards for cutting-edge utilities. In addition, the value of Smart Grid technologies has been difficult to quantify in a simple cost-benefit analysis due to the multi-tiered benefits they provide to the utility, the consumer, and society. A smart grid will require service providers to operate in new ways and be willing to take reasonable risks for reasonable rewards. Regulators will need to design rules such that customers who do not change are not worse off, but that businesses can pursue advantageous arrangements between participating suppliers and consumers. Unfavorable Interconnection Standards - Interconnection standards need to be put in place universally before significant progress can be made to accommodate all generation options.. Once favorable interconnection standards are completed, DG will have more opportunity to expand. Currently, less than one-third of (only 15) states have standards that are favorable to DG and 27 states have interconnection standards that are neutral to favorable. Federal legislation attempting to deal with this issue emerged in progressively stronger language, culminating in the Energy Policy Act of 2005 (EPACT 2005), which requires all state and non-state utilities to consider adopting interconnection standards based on Standard IEEE 1547. IEEE 1547, which was published in 2003, looks strictly at the technical aspects of distributed generation interconnection, providing a standard that limits the negative impact of these resources on the grid. In part to address some of the permitting aspects of interconnection, the FERC issued FERC Order 2006, which mandated that all public utilities that own transmission assets provide a standard connection agreement for small generators under 20 MW. While compliance with the FERC 2006 order is mandatory for public utilities that own transmission assets, other utilities have come under similar legislation at the state level. The progress in developing these laws, however, has been fairly slow. Even states complying with the mandatory FERC order have taken over two years to enact these relatively simple rules. States that have taken aggressive action on distributed generation have tended to do so for other reasons, such as meeting renewable-portfolio standard requirements. In 2008, the EPA did a study of the 50 states and the District of Columbia, assessing their standards for interconnection. The EPA’s study based its criteria for favorability on whether or not standard forms were in place, time frames for application approval, insurance requirements, distributed resource sizes allowable, and interconnection study fees. With these factors considered, only 15 states were classified as having “favorable” interconnection standards, with 27 states either being “favorable” or “neutral.” The fact that there are five states with unfavorable policies towards distributed generation is also cause for concern, although it is worth noting that that these states are all in the southeast region of the United States perhaps indicating a regional issue. California’s progressive distributed-generation interconnection policies place no limits on the size of the resource. This is coupled with strong incentives for renewable sources of energy, such as photovoltaic solar panels, primarily for the purpose of promoting cleaner alternative power sources and reducing transmission congestion. California’s policies have had a strong impact along the west coast. Coordinated State and Federal Framework - Develop a regulatory framework that is harmonious on the federal and state level, encourages investment, and provides regulatory certainty on how costs are going to be recovered. Smart Grid Legal News - Blog provides timely information and legal commentary on issues related to the smart grid, including activities at state regulatory commissions, the Department of Energy (DOE) and the Federal Energy Regulatory Commission (FERC). EPIC's Legislative Center provides a listing and summary of pending energy-related legislation.